all things dubwise and bass heavy, from NYC to the world. Thur 9/20 - Dub Champions Festival warm up! Deadly Dragon's Downtown Top Ranking, Dubwise! Super Ape Returns to Conquer! Lee “Scratch” Perry & Subatomic Sound System team up to re-imagine the Perry’s classic, genre defining dub album, reloaded for the sound system generation. Out now on DL, CD, & vinyl LP. NYC-2-Africa-2-Brasil remix EP digital release out now! Lee “Scratch” Perry & Subatomic Sound System, “Black Ark Vampires”, a throbbing sound tune propelled by subsonic bass, bubbling skanks, and pulsing beats that balance the mystical vibes of classic Jamaican dub reggae recordings with the flammable energy and subsonic vibrations of current electronic bass music, a recipe perfected during their past four years of tours spreading authentic dub to a new generation in places like Coachella, Dub Champions Festival, and Red Bull Music Academy. “Jah is Coming” is a bass charging 140BPM rootical dubwise UK steppers style cut inspired by classic 70s Jamaican dub. “Dubbing on the Moon” on the B side is a pulsing roots dub driven by a thunderous bassline built on Subatomic Sound System’s original reggae rockers riddim “Our Father, Our King” produced and dubbed in a Jamaican style. Skarob is a collision of bass music and dub reggae from the duo of veteran Brooklyn rasta Doctah X and Eastern European expatriate Rekloos, transplanted to the unlikely heartland of America. Two separate 45 exclusive mixes, one with Anthony B on the original Subatomic Sound System & Nomadic Wax “NYC-2-Africa” riddim and the the second on the Dubblestandart “Kingston Riot” riddim. “Hello, Hell is Very Low” / “Bed Athletes” Ari Up and Lee Scratch Perry’s only appearance together on record. Remixes by RSD & Subatomic Sound System. 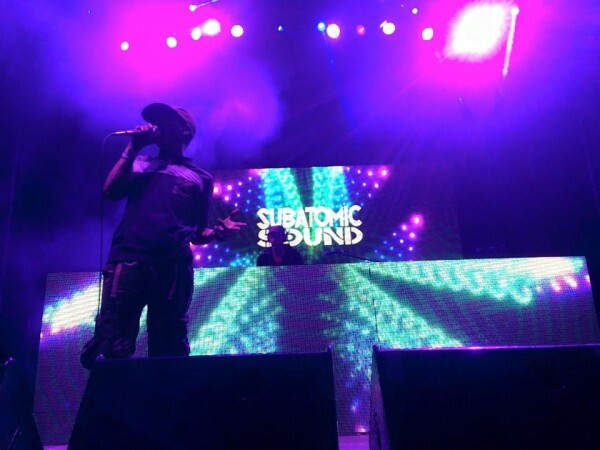 Subatomic Sound is a dub and bass culture focused record label, radio show, event promotions, and home to the Subatomic Sound System DJ/production crew and live band -- based in New York City and hard at work on every level. Spearheaded by Emch as producer, DJ, and musician, Subatomic Sound does original production, audio recording, audio mastering, sound design, soundtracks, live performance and DJ sets. Subatomic Sound System is known for genre bending dubwise productions, explosive shows, and breaking down barriers with a forward thinking adaptation of 1970’s Jamaican sound system culture and analog dub reggae studio techniques to current bass music genres, digital technology, and live performances.